AN international theme park giant is to open a new multi-million euro attraction in Spain. French company Puy de Fou will funnel €140m into its newly revealed Toledo attraction park, which will be themed on the history of Spain. Four thousand jobs are expected to be created through the new park, which is expected to open its doors in 2021. The Castilla-La-Mancha region beat Andalucia, Madrid and the east coast to be the chosen location of one of three new attractions the firm hopes to open worldwide in the next decade. Work will start on the park in 2019. “It will generate an extraordinary growth in GDP for the region and around 4,000 jobs,” said Emiliano García-Page, the president of the Junta de Castilla-La-Mancha. 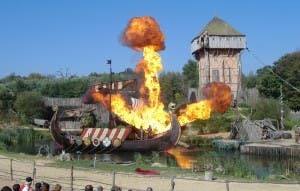 Puy de Fou’s eponymously-named Medieval-style park in France is only second in popularity to Disneyland Paris.